Anna Kokkalis Demetriades was born in 1936 in Dallas, TX, to James Miller (born in 1897 as Dimitrios Kokkalis in Patras, Greece, and naturalized James Miller) of the Kokkalis-Petimeza families noted for their leadership in the Greek War of Independence from the Ottoman Turks and their efforts to get rid of "royals" imposed on Greece by foreign powers. Anna's mother's family comes from the earliest settlers of Virginia and North Carolina with roots traceable to the Plantagenets and includes a "surety" of the Magna Carta. Anna's mother was a descendant of the Moseleys and Alstons who settled in America in the early 17th century. Anna is also a member of the Daughters of the American Revolution (DAR). Sterge T. Demetriades was born in 1928 in Athens, Greece to Theodore Demetriades (1893-1973) and Vassiliki Tsafka (1903-1999) Greek refugees from Stenimahos (now Asenovgrad), Philipoupolis (now Plovdiv) in Bulgaria and Constantinople (now Istanbul). Their families were well known in their towns of origin for water mills, groceries, wine-making and silk cocoon breeding. Anna and Sterge have three children, James Theodore, Aliki Catherine, and Alexander Anthony Sterge, as well as ten grandchildren. Anna and Sterge have founded three successful small corporations that specialized in energy conversion research, software, national R&D planning and city planning. Sterge's name derives from Asterios. Anna is an experienced business manager and certified school teacher with degrees in education. Sterge holds an AB degree in Physics, Math and Chemistry from Bowdoin College, an MS degree in Chemical Engineering from the Massachusetts Institute of Technology, where he extended the work of his professors, and a Mechanical Engineer's degree from the California Institute of Technology. At Bowdoin, Sterge won many prizes and honors (e.g. the Sewall Premium in English Composition as a freshman, full scholarships, Phi Beta Kappa, Honors in Physics, Charles Carrol Everett Graduate Scholarship). Ares Rosakis, Chair of the Caltech Division of Engineering and Applied Science states: "Mr. Demetriades is a very loyal alumnus. 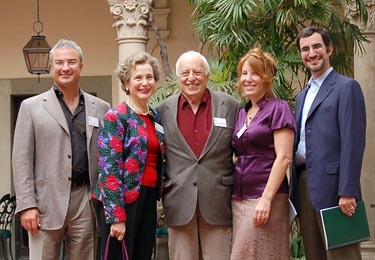 Despite a negative experience during his student years involving a fellow student which led to his decision not to pursue his PhD degree, he has continued his close intellectual contacts with the Institute and has consistently supported Caltech through the establishment of the prestigious Demetriades-Tsafka-Kokkalis Prizes." In 1952 Sterge Demetriades collaborated with the Joint Intelligence Objectives Agency and the Office of the Chief of Ordnance in the areas of propulsion and weapon systems. He proved to be a very innovative scientist and a brilliant engineer. He has published numerous technical articles, and is an invited contributor to technical handbooks and encyclopedias. One of his first conceptions, which he developed independently while still a graduate student at Caltech working on problems associated with the flow of blood was a system called the Propulsive Fluid Accumulator, or PROFAC (received JBIS 3 Jan 1959). It is a device that orbits at an altitude of roughly 110 km, collects atmospheric gases, stores the oxygen to refuel devices for high-thrust space missions, thus eliminating the need to lift oxidizer to orbit, while using the nitrogen in an electromagnetic thrustor (powered by solar cells or other means including nuclear) to overcome drag and maintain orbit and/or use for propulsion in deep space missions where higher specific impulse is required. It is the simplest of a series of devices he proposed before 1959 and published in more detail later while at Northrop Corporation (16 Feb 1959 to 29 Ju11963) in a number of papers entitled "The Use of Atmospheric and Extraterrestrial Resources For Space Propulsion, Parts I-IV"; see National Archives: ARC Identifier 1250057, ...58, etc. In 1954, in the middle of the McCarthy era, Mr. Demetriades resigned his job at the Ballistic Research Labs at Aberdeen Proving Grounds (at the top of Chesapeake Bay) and came to California in care of his brother, already a Caltech Ph.D. candidate in Aeronautics. While in California he worked for a year with Bill Lear in Santa Monica while setting up his consulting practice with Aerojet and other Aerospace firms (including JPL after 1963). Mr. Demetriades applied to Caltech for graduate work leading to a PhD specifically under Prof. H. S. Tsien and was admitted in the fall of 1955. Following Professor Tsien's departure, he briefly worked with Professor Penner and then with Professor Harold Wayland to study the flow of blood in capillaries. This work ended in 1958 after publication of the theoretical part of his thesis. From 1964 to 1995 Mr. Demetriades was Founder and Chief Executive Officer of several privately-held research and development companies in the aerospace, energy and large device/system simulation environments, most recently at STD Research Corporation, a scientific research company based in Arcadia and Monrovia, California. Sterge was elected Fellow of the AIAA in 1985 and received the AlAA Plasmadynamics and Laser award in 2010 for his outstanding contributions to the understanding of the physical properties and dynamical behavior of matter in the plasma state and lasers as related to needs in aeronautics and astronautics. He is recognized for his distinguished career in plasma physics, plasmadynamics, and magnetohydrodynamic technology, and for providing major contributions to enhance the understanding of plasma processes and MHD systems for terrestrial and aerospace applications.